Some prisoners will have gang allegiances upon entering your prison. This can make those prisoners much harder to deal with, as they will work to defend each other during trouble. Gangs are an optional feature, enabled by ticking the "Gangs" tickbox in the New Map screen. More dangerous / higher security prisoners are more likely to be gang members, and can be identified visually by their full body tattoos. When a fight breaks out, gang members will always come to the aid of a fellow gang member, including coming to the aid of a fellow gang member involved in a fight with guards. Gang members are more likely to try to steal weapons, and more likely to carry them rather than to stash them. Gang members will not participate in any voluntary reform programs, and will not work for the prison. Known gang members and the number of members in each gang can be seen by choosing the Intelligence => Gangs menu. 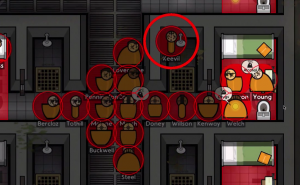 Sometimes a Legendary prisoner who arrives through Intake will also be a gang leader. They will immediately assume control of their gang, and will establish a leadership hierarchy. Gang leaders can promote gang members ("soldiers") into Lieutenants, at a maximum ratio of 1 lieutenant:10 soldiers. Gang leaders can also recruit non gang-members into the gang, by visiting the prisoner. Gang members are fiercely loyal to their leaders, and will become angry (rising the risk status of the prison) if their leader is in Solitary or Lockdown. If a gang member is killed, the entire gang will immediately attempt to start a riot. The probability of receiving a gang leader increases as the size of the gang increases. The Lieutenant briefing his soldiers, who are about to stage a play in order to claim territory. Claimed territory under the Intelligence > Gangs. 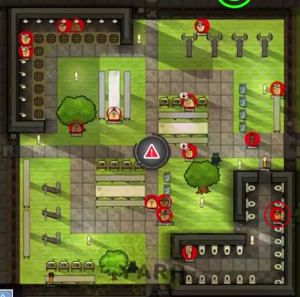 At some stage, Gangs will attempt to take control of key areas of your prison (Yards and Common Rooms). This attempt is called a 'Play', and is led by a Lieutenant. The Lieutenant will gather a group of gang members together and give them instructions. These soldiers will then proceed to the zone in question, and assert their authority over that zone. If they are unchallenged, the territory will turn their colour and they will have ownership of it. 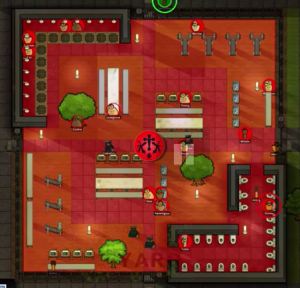 The player cannot build or change room setups within gang territory. Once captured, territory shows up in the Gangs view as the colour of the gang who has claimed it. Rival gang members are not permitted into the territory, and non gang-members can enter the territory and use the facilities (e.g. Phones), but must pay Protection Money to the gang. Gangs accumulate money from non gang members this way, and will use the money to buy equipment such as stolen weapons. From time to time a lieutenant will arrange a 'Play' to revisit the territory with a group of soldiers, as a show of force. Sometimes a gang will be strong enough to take a territory from a rival gang, which will only be done if they have sufficient numerical advantage. A lieutenant will arrange a Play and will send enough soldiers to take the territory by force. Once a gang has claimed a territory, they must be evicted to remove their influence. Click on the "Evict" button in the gang view to begin this process. Any gang members within the territory will immediately turn hostile, with nearby gang Lieutenants will arrange new 'Plays' in an attempt to re-capture their territory from your guards. Once you have defended the territory for 24 hours, the ownership reverts to 'Unclaimed'. During this process, other gangs may use this time to their advantage and stage plays on other territories while rival gang members are occupied in combat. With enough guards, you can protect a territory against any gang control. This can only be done with an unclaimed territory - any gangs must be evicted first. Security rooms also count as territory, and are automatically guard-controlled. Guards can project their power from security rooms to any neighbouring territory. E.g. a security room with 10 guards inside will 'project' 10 guards onto all neighbouring yards, common rooms etc. 'Neighbouring' means there must be a door between the security room and the yard/common room. This page was last edited on 21 November 2016, at 13:43.